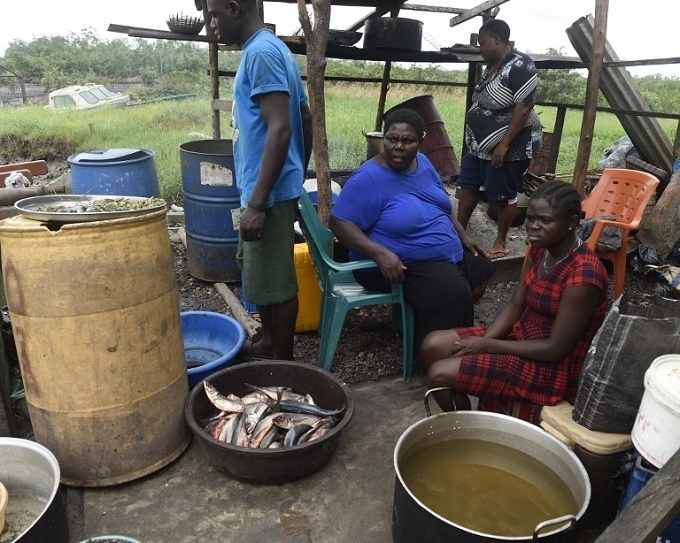 Women sit in makeshift kitchen to cook for fellow protesters near the Belema Flow Station and Gas Plant on August 23, 2017, shutdown temporarily by Shell Petroleum Development Company (SPDC) following continuing occupation of the plant by host Belema community in in the Akuku Toru district of Rivers State in Nigeria. Photo by AFP/Pius Utomi Ekpei. 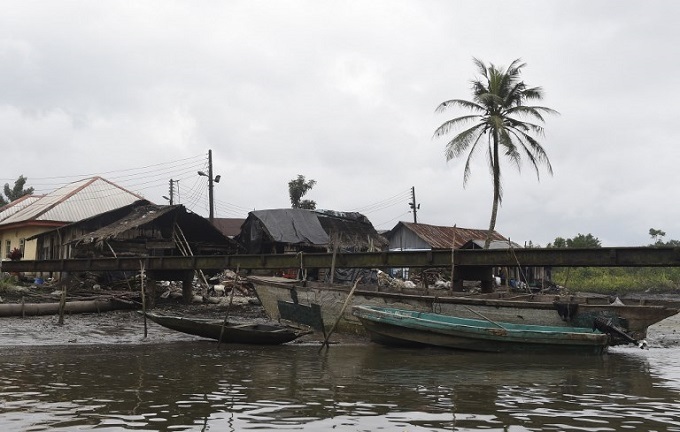 For 37 years their community in Nigeria's southern Rivers state has lived in the shadow of an oil pipeline transit station run by Shell's local subsidiary. Despite the enormous natural riches that pass them by, locals say they have not shared in the explosion of wealth that black gold has brought to Nigeria. The country exported petroleum products worth $27.8 billion (23.1 billion euros) in 2016 alone, according to OPEC, and is Africa's largest oil producer and exporter. But Belema residents still rely on an unhygienic open-air well for drinking water, while a complete lack of medical facilities means the sick have to be ferried to Abonnema -- a boat journey of three hours. On August 11, local reached breaking point. Frustrated with the dire situation in the area, hundreds of people stormed the nearby Shell flow station, demanding the Anglo-Dutch oil giant leave the area over its alleged failure to improve their lives. The occupying protesters -- 550 women and 350 men -- work in shifts to maintain a constant presence, according to local chief Evans Dabiri. The protest raises the spectre of the militant campaign of recent years against oil infrastructure in the region that slashed output and caused chaos in the sector. That violence was eventually tempered after successful but lengthy negotiations with the armed groups angered by the unbalanced distribution of oil riches. "Shell has overstayed their welcome here for 37 years -- and we have not benefited anything from them," Dabiri said. "Tell us what they have done there in the past 37 years. "We are in no hurry to leave this flow station as we will be here until Shell hands (it) over." He explained to AFP the occupiers want the critical piece of Nigeria's oil infrastructure transferred to a local company. At the station, women with canopies, mattresses and sleeping mats took turns guarding the site, cooking for the other protesters and entertaining themselves. The action prompted the army to deploy 30 extra soldiers to monitor the situation, according to a State Security agent. Shell insists it has invested in social welfare and created jobs -- efforts it says were frustrated by local power struggles. "Legal tussles and disputes among the oil-producing communities (have) made it impossible for Shell to implement planned development projects for the communities," said Shell Petroleum Development Company of Nigeria's (SPDC) external relations manager Igo Weli. Shell still managed to invest 600 million naira ($1.7 million) to improve schools, infrastructure and health provision in both Belema and neighbouring Kula in the past 10 years, he added. The community has none the less suffered from chronic neglect and been preyed upon by pirates who cruise the regions' waterways in search of boats and valuables. Thatched houses are seen near the Belema Flow Station and Gas Plant. Hundreds of protesters from the Kula and Belema communities in Nigeria's restless southern Rivers state have occupied the plant since August 11 to press their demands for jobs and better living conditions. Photo by AFP/Amelie Querfurth. "We are at the mercy of sea pirates who lay siege on the waterways as they rob our people," said Dabiri. The pirates, undeterred by at least six military checkpoints that dot the route from Abonnema to Belema, continue to operate with impunity. Shell is now warning the extended occupation at the flow station could be endangering not just the protesters, but other communities in the region. "SPDC is deeply concerned that unauthorised persons -- including women and children -- have been observed in close proximity to equipment... without the protection of safety clothing," said SPDC spokesman Joseph Obari in a statement. He said there was a heightened risk of an oil spill or fire as a result of the protest action because engineers had been unable to prepare machinery for a long-term shutdown. However there is growing optimism at Shell that the occupation will soon be brought to a peaceful end. The state oil company NNPC, local leaders and Shell have brokered a deal that could lead to the reopening of the site, according to a traditional chief in the area. "We have succeeded in reaching a truce with NNPC," said Godson Egbelekro. "Within this week there will be a joint inspection... after which we will withdraw all our subjects from the facility. Then SPDC can resume operation." But the community's demand that the station be handed to a local company will go unfulfilled -- at least for now. "As far as (the NNPC) are concerned, SPDC is still the company running that facility," said Egbelekro. "There is machinery in motion for the handover of the flow station (back to Shell)."